travel guidance and ideas, with a focus on restaurants, food, wine, and hotels. This summer, we opted for the quiet lushness of Palm Beach instead of action-filled Miami. A perfect getaway if you're looking to disconnect on a beach with a book, a cocktail, and not much more. What it lacks in hipness, it makes up for in natural beauty and old money glamour. The absence of crowds and lower rates make Florida one of my favorite summer destinations. As long as you don't mind the possibility of a hurricane strike, the weather is glorious on the eastern coast. Our friend Laura convinced us that a deal was to be had at The Breakers, where standard room rates can run to $780 (and beyond) in high season. May-September rates are as low as $249 per night, and include free amenities Sunday through Thursday. For those with children, like Laura, this was a true value, as those amenities include kids' camp and kids' meals. Though we tried, Dan and I did not navigate Palm Beach as well as we should have. There is a way to get more value out of a trip, and we learned some lessons the hard way (see $75 breakfast). Here are some tips to create the perfect balance between luxe and low cost. Dine locally - often. The Breakers has a number of fine and casual dining establishments, but somehow they all cost the same -- $100+ per meal (for two). Dinner entrees run $24+, and $32 for an underwhelming Chicken Marsala seems excessive. The hotel automatically adds a 20% gratuity to each bill, plus a service charge and tax. The resort is within walking distance of a variety of restaurants, so it's simply a matter of sourcing and planning. We had two nights out, at Nick and Johnnie's and Bistro Chez Jean-Pierre. Nick & Johnnie's is a fun, casual place with outdoor seating, while Cz Jean-Pierre is old Palm Beach glamour and excellent French food. Our meal there was better than any we'd had at the hotel. Both recommended. Laura tried Todd English's new casual dining place, Wild Olives, located a short cab ride from the hotel. Good with or without kids, and her report was that happy hour was a great value ($7 for two drinks), and the food was excellent. Sunday-Thursday complimentary breakfast, and an on site Gourmet shop. A bonus to being there during the week, the hotel offers complimentary continental breakfast in the Circle restaurant from 7-11am. For $10 more per person, you can add on the full breakfast. A much better deal than the $75 breakfast we had the Saturday morning we arrived, not knowing the deal ahead of time. Because Saturday is out of the complimenary breakfast window, we could have picked up coffee and a bagel (or other breakfast food) at the Gourmet shop for $8. Take advantage of the 5-7pm Happy Hour. In the Tapestry Bar, $6 drink specials paired with homemade potato chips (complimentary) and spinach dip (a delicious add-on) make a perfect cocktail hour pairing before dinner. Stock your room with wine, beer, or your beverage of choice. This may seem gauche in a place like The Breakers, but I don't mind telling you that I like a glass of wine at the end of the day and don't want to play $20 per glass. You can purchase a few bottles at a local wine shop or at Publix, and it will go a long way towards the value of your trip. Bonus activity: A bottle of wine + some plastic cups poolside after hours, to enjoy the ocean view under the stars. Always ask. We were upgraded everytime. The staff at The Breakers is unbelievably accommodating, so when we arrived early (looking a little weary from our 6am flight, I am sure) the front desk attendant upgraded us to an ocean view room. Much easier during the summer season no doubt, but a nice gesture on her part. Late check-out? Granted. Car rental so we could go to Miami for a day? No problem. Hertz has a desk in the hotel, and the concierge handles the rentals. She upgraded us as well, charging us an economy rate for a standard car. Always ask. Dan and I are just back from a weekend in San Francisco. We stayed at the Laurel Inn, a renovated motel in Pacific Heights with a groovy neighborhood cocktail lounge called Swank; had soju ramoz fizzes and chicken hash for breakfast two days in a row at Ella's (across the street); walked 9 miles to golden gate park, the beach, and back; had a late night dinner at Firefly in Noe Valley, and a quiet Sunday dinner at Garibaldi's, which was an unexpected surprise. One of my primary missions in NOLA was to find a great local watering hole undiscovered by tourists. Through a recommendation on Twitter, I'd booked a reservation at miLa, which features cuisine constructed by two disctinct influences: that of Louisiana, and that of Mississippi. My dinner was a simple and savory halibut with mustard sauce made decadent when paired with cheddar and chive cornbread. One of the nicest features of the restaurant is the seating. The booth design dims the sound of surrounding conversation, making it a good place to catch up with an old friend. miLa is located in the Renaissance Pere Marquette hotel, which houses Bar Uncommon - infamous, if only for it's bartender Chris McMillan. Chris is a 4th generation bartender, founded the Museum of the American Cocktail, and crafts both original and classic cocktails without the pretention one might (or, does) find in New York or San Francisco. Irene has been scolded by bartenders over her preference of flavored spirits like raspberry Stoli; some have even refused to make her the drink she wants. Chris didn't judge; rather, he created an original drink just for her that involved muddled ginger, gin and fresh strawberries. His instinct was spot on, and she downed the first drink before he could even begin making her another (different from the first, her second again began with muddled ginger, but went in the direction of tequila, fresh green apples, and lemon juice). My drink was called New Orleans is Drowning - bourbon, cognac, campari, simple syrup, and bitters. Quite delicious. While mixing drinks, he talked about the history of the ingredients, the differences between bars in NYC (classic and artisanal style) v. San Francisco (local and organic ingredients), told us about some up and comers in New Orleans (Cure), and answered the ultimate question: if he were to go have a drink in NOLA, where would it be? Answers: Swizzlestick, French 75, and the Sazerac Bar at the Roosevelt hotel. His knowledge of cocktails and the history of New Orleans is deep, and it is a poetic experience to sit at his bar. Breakfast was, of course, at Cafe du Monde. 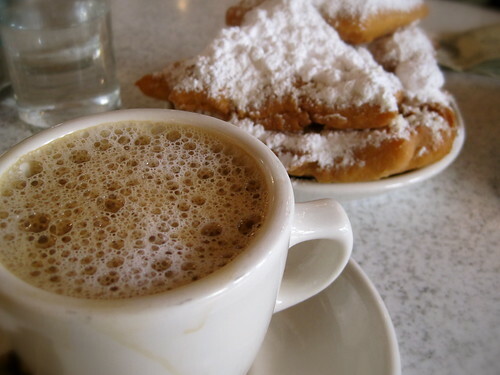 No trip to New Orleans would be complete without several cups of the famous cafe au lait partnered with light-as-air beignets drowning in a pile of powdered sugar. It was enough to keep us going for awhile as we wandered through the French Quarter, though the temperature hovered around 29 degrees. We ended up, as you do, in Reverend Zombie's House of Voodoo, and Irene couldn't help herself - when the cashier mentioned to her that one of the house psychics was available to do a reading, she handed over $20 and disappeared. Though, I think the major selling point was that they had a heater in the back. While she got the low down on her future, I chatted with the huge tattooed skinhead dude, who was totally sweet and told me where to get great Vietnamese soup. Our days in New Orleans were dictated by where we were going to dine each evening. I'd booked a reservation at Herbsaint, where I'd been before and the fond memories have lingered ever since. The restaurant is located about 2 blocks from Le Cirque, in a renovated building with large windows that look out onto St Charles avenue and the passing streetcars. There is a lovely front bar, and the dining room is open and airy - almost like dining outdoors. Irene had the short ribs, and I had one of the evening specials - skate with a blood orange and bacon sauce, cooked perfectly, with a side of roasted cauliflower and a sazerac. Both dinners were perfect, and Herbsaint did not disappoint. I've read some reviews that complain about the wait staff, but our waitress was lovely. It's the atmosphere that I love - a quintessentially New Orleans vibe that permeates into the dining room. The couple at the table next to us, finishing up their dinner and already a few cocktails in, joined our conversation when we were discussing how to spend the next three days. They enthusiastically added to my rapidly growing list of places to dine, drink, and hear music by telling us about:The Rivershack Tavern and the Mapleleaf for live music; for dining: Patois and Lilette; and, for trouble: F&M Patio Bar, where customers dance on the pool tables. To wit, a quote from Yelp about F&M: I like to arrive around 2 am when the crowd really begins. Decisions were going to be tough. Dan made this fantastic lunch for us today. You should try it - under 30 minutes to make, and utterly delicious. His post and the recipe here. I grew up with this magazine, learned about food and travel by reading the exquisite editorial features, and still treasure each edition like a favorite book. 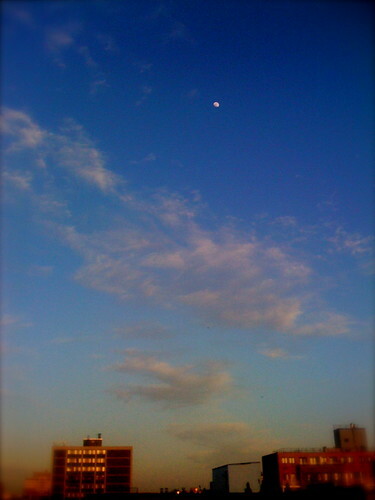 View from the deck, the last time there was a warm(ish) evening in Hoboken, where we enjoyed cocktails before heading to dinner at the not to be missed Augustino's. Italian dining may not seem like anything special in New Jersey, but the experience at Augustino's will remind you of how good it really can be. The restaurant is tiny, warm and welcoming; and the food is the real deal: made-from-scratch pasta dressed in rustic sauces (a garlicky broccoli rabe; creamy, salty carbonara with spring peas and pancetta), served in plates so big that you can split one main dish, and wisely save the extra room in your stomach for a homemade cannoli. And lots of chianti. This is a Flickr badge showing public photos and videos from kirsten.c. Make your own badge here.